Spellchain by Twofish Kft. 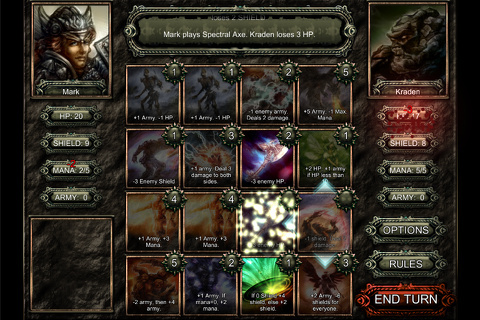 is a turn-based strategy card game app for iPhone, iPod Touch, and the iPad. This app requires iOS 3.1.3 or later and is optimized for the iPhone 5 screen as well. Simple controls mixed with luck and strategy is what this game is about. The cards are well drawn and have various effects when played. This game has hotseat multiplayer. The controls are simple but the game takes some time to master. The text and cards are small but by tapping the card once or dragging your finger over it; you can see a bigger image on your lower left corner. The larger image shows the name and text of the card. Tap a card twice to use it. Both players start out with twenty HP, ten Shield, five Mana, and zero Army. The goal is to reduce the opponent’s HP to zero. Shield will block damage done to your health. Most of the cards cost some amount of mana while a few have zero cost. The cost of a card is found on its upper right corner on the field. One card can increase your max. mana but it will require some HP and mana. An army attacks at the end of the respective player’s turn; they attack an enemy’s army if they have one and will reduce the size of that army by various amounts (depends on the size of both armies) at the cost of their own. The top section of the game tells you what cards were played and you can scroll through it but it is a bit difficult to see and use. The play field is filled with four by four cards and it replaces a card when one is used at the end of a player’s turn. Pick any card on the field to use it if you have the mana for it; you can then select an adjacent card and use it if you have any remaining mana or it’s free to use; this keeps going until you run out of mana or no more cards are available to be played (this is unlikely to happen). When everything is done, press the red end turn button to allow the opponent to take their turn. You can change the difficulty of the computer from easy, normal, or hard by sliding the circular switch. The AI can be smart or kills itself even if it’s about to win. This game has a lot of luck involved but if you keep track of the field and think ahead of time, you can reduce it. There is no online multiplayer but it does have hotseat multiplayer which is enabled when you pick Players then tap on the word Computer to change it to Human. When starting a game, don’t tap too fast or you’ll miss the quick overview of the game while the rules can be found during a game session. The graphics are polished despite the cards and text being small but the left-hand corner helps. I played Spellchain on my iPod Touch 4G so maybe others will have a better view on other devices. On my device, the game lags when I press End Turn and it can overheat if I play for a while. The art style is well drawn and features soldiers, a giant spider, dragon, faerie, spells, etc. The title screen is empty while in-game cards disappear with a few special effects but you will not see a dragon, your army, an axe, etc. I think the lack of monsters and spells appearing onscreen is fine if there are a lot of cards but at the time of this review there isn’t. You can pick from four different character portraits for now. Audio is lacking, there are only two songs and the game has generic sound effects. The title screen features a song that has someone singing with unintelligible words. I think that song sounds fine while the other song played during a game is on repeat and it seems bland to me. Sometimes there is no audio at all so this needs to be fixed by a future update. I was expecting this game to have iPod music support but it doesn’t. Spellchain is available for free on the iTunes App Store. I admire Twofish for making a game free with no in-app purchases and ads. Some cards I like to use are Corpse Elemental when I have no army or to prevent my opponent from having one, Power Drain which deals four damage to your opponent then you gain four HP, Energy Elemental, Guard, Spectral Axe, Hymn of Death for five points of damage, Corpse Explosion, and a few others. The problems I have with this app are the lack of consistent challenge, no reward system, and lack of character distinction such as different skills or different card set. I like the concept of this game and I hope some of the things I mentioned will be fixed. 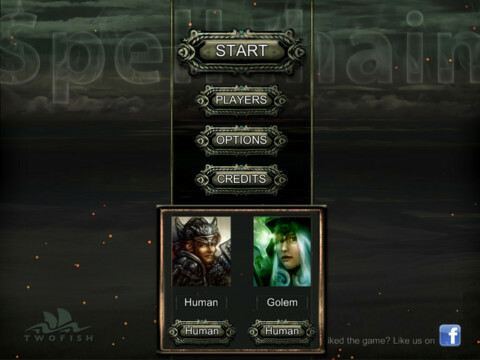 AppSafari review of Spellchain was written by Tony Lau on April 1st, 2013 and categorized under App Store, Games, Strategy. Page viewed 4885 times, 1 so far today. Need help on using these apps? Please read the Help Page.